•Kit include lever base, adjustable plate and a knurled toe-tip, giving the rider a solid grip while shifting. •Constructed of CNC-machined 6061 T6 aluminum offered in a black anodized or chrome finish. •Adjustable design ensures the best “fit for your foot” and for your riding position. 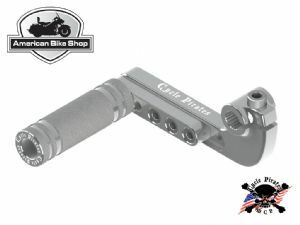 •Knurled brake/shifter peg measures 2-3/4” long x 1” in diameter. •Lever provides eight positions between 1-1/8” back to 2” with plate fully extended.